Here are fabrics from all around the world. They blend together to form a giant hand that supports our world, because the world is, truly, in our hands. It is up to us to Imagine Peace, and to bring peace to it by all working together. In the background is a “Trip Around the World” traditional pattern, with the words “Imagine Peace on Our Planet” worked into the colors of the borders surrounding the giant hand. Yes, the words really are there, in letters 10” high - but you have to work a little to see them. My son and I were learning sign language, so it is his hand saying “I love you” in each of the four corners.. On the back is a huge mask made mostly from African batiks. This is the mask of the Happy Medium - what we all need to strive for to make peace happen. Have you ever noticed how closely the current revival of the quilting movement resembles the French Resistance movement? Think about it. 1. Most quilt guild meetings are at some church, either in the dark of night or at a time when people won’t notice a large number of women coming singly or in VERY small groups walking nonchalantly up to an unmarked door, and slipping inside. 2. All the people carry bags of various descriptions, anything from plain unmarked brown bags to garbage bags to pillow cases, usually marked with strange runes and signs made of squares and triangles. These characteristics all remind me of a small, revolutionary band, gathering out in the hinterlands, a secret society to whom other quilters automatically feel linked. We all sew, we all mix fabric and color and stolen time to do make art out of old scraps, beauty out of cast-offs, something out of worn-out nothing, or buy new fabric just to cut it up and resew it. This is not something that a whole lot of people understand - and a quilting guild functions in many ways as a support group of the highest order. The members help in time of need, understand when things go awry, and have sometimes had to hide out from the Quilt Police, themselves. I think quilting is a Resistance in other ways, too: a resistance against mass production, shoddy workmanship, and an uncaring world. We take the time and the fabric and the memories and wrap them all up in something to keep someone we love - or maybe don’t even know - warm. We do it to remember them, to connect them to all the people who go before us and after us, the children and the grandchildren and the great-grandchildren and the people who will be touched by our work even if they never know our names. They may never see our faces or hear our voices, they may never touch our hands, but they will know us. Most of these quilts are given to Shelters, to the homeless, to the forgotten ones, all with the hope of making the world a better place, all part of the quilters’ Resistance Movement. I got to thinking - what if everybody did? What if every person who could do something, did? Something, anything, to help bring about peace in our time. I’m not good at a lot of things, but I can make quilts. So I did; and the quilt I made with this in mind has started to do its part to bring about understanding and world peace - a little at a time. It was chosen as a logo for a women’s shelter, it was used for a celebration of ethnic diversity, and I have it on good authority that even teenagers think it’s “awesome, dude, really awesome.” Anything that gets a teenager’s attention, that makes them take out their earphones and join the human race - at least temporarily - must be worth something in the great scheme of things. It’s not the greatest quilt in the world - but it’s doing its part. Lots of other quilters - members of the Resistance - are out there, too, doing what they can do. I spoke at a Guild meeting in Berkeley a while ago, and at that meeting was a group of visiting Australian quilters. They brought FIFTY completed tops with them from Australia, to be donated to the Children’s Relief fund in Berkeley. My quilt guild, and your guild, and guilds all over the world are putting little scraps of leftover fabric, brand new fabric, stolen time and scavenged batting together to make quilts for people who need to have something given to them made by caring hands that they can call their own, when all else has been taken from them, even their dignity. Our guilds give these quilts to people who are on the run from abusive spouses and intolerable living conditions, suffering from terminal illness, or are carrying their few possessions in garbage bags. We are making AIDS quilts and cancer quilts, preemie baby quilts, lap quilts, Quilts of Valor, and raffling quilts to make money for the poor and forgotten ones. We’re out there, all over the world, doing our best to put the message out that there are still caring people in the world; people who know the importance of people helping other people, people who know about quilts. So, be an active member of the Resistance and do what you can do, whatever that may be. Make a quilt for community quilts, or join a friendship group, or volunteer to help with your quilt show. Go and share at your guild’s meetings and get to know your fellow Resistance members, and let them get to know you. Be part of the Quilters’ Resistance against an uncaring world, and know that you are not alone. God bless the people in need, and God bless the quilters, too. Every one. Here is the back of Imagine Peace on our Planet. 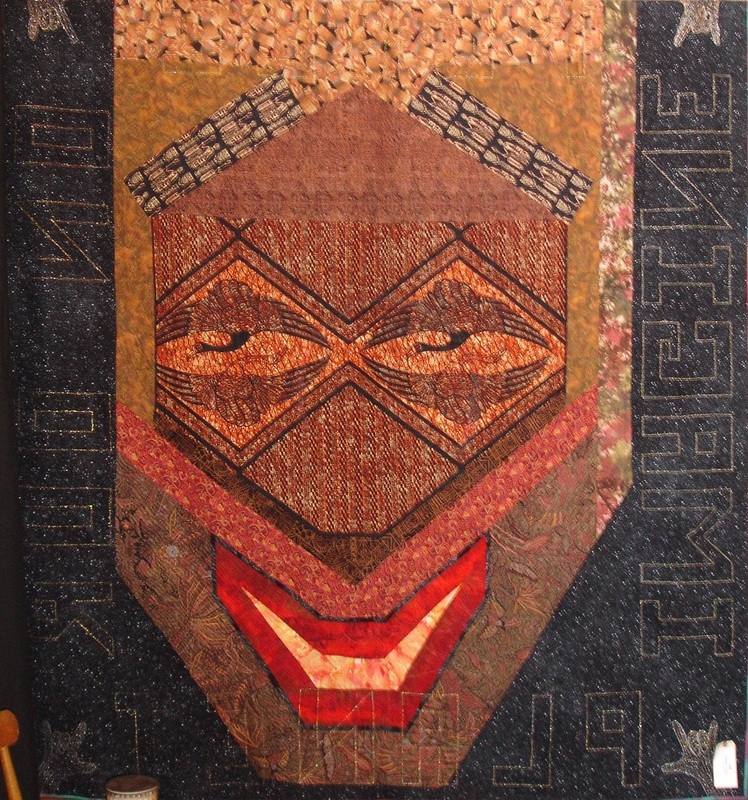 It is the face of the Happy Medium, done in huge pieces of African batik, and you can see the outlines of the words on the sides of the quilt done in hologram thread, as well. Here you can see a little bit more clearly the word PEACE across the top of the quilt. Each letter is 10" hight, but it takes a bit of work to see the words.